In the spring of 1943 Allied intelligence became aware of the ME262 jet fighter, little was known about it but under the direction of Henry H. Arnold, the Commanding General of the U.S. Army Air Forces the decision was taken to bring the USA into the jet age. The development of the earlier XP59 Airacomet had not inspired confidence in the turbojet jet but with the reliability and power of the British developed engines increasing by the day the Americans decided that they could not afford to be left behind. Arnold went to Lockheed and convinced them to build an airframe around the de Havilland Halford H1 (Goblin) which was already produced almost 2,300 lbs of thrust of the drawing board with promise of a great deal more. A design was submitted by what would be known as the 'Skunk Works' team led by Kelly Johnson claiming that the airframe could be built and ready for testing in 180 days, in the end it took just 143 being delivered to Muroc field (now Edwards AFB) on the 16th November 1943. 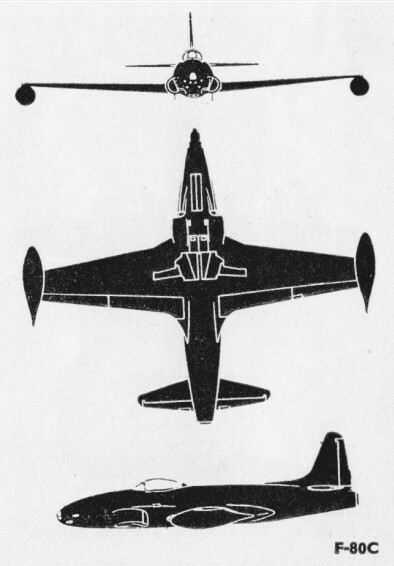 The design proved acceptable to the USAAF was a low-wing cantilever monoplane with a knife-edge laminar-flow wing section; engine within the rear fuselage; air intakes on each side of the fuselage forward of the wing leading edge; and retractable tricycle-type landing gear. Equally attractive was the company's proposal to complete an initial prototype within 180 days and little time was lost in awarding contracts for three prototypes and 13 service trials aircraft. Work on the first prototype began in August 1943 and just 143 days later (on 8 January 1944) this aircraft flew for the first time. The first flight was delayed by foreign object damage which destroyed the engine on the first run up. A new engine was shipped from Britain allowing the first prototype (44-83020) nicknamed Lulu-Bell to get airbourne on the 8th January 1944. It was flown by Lockheed test pilot Tony LeVier. 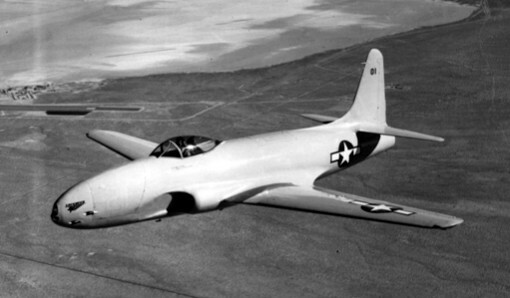 Service designation of the prototype was XP-80. Its power plant was a 13.34kN de Havilland H-1 turbojet. Plans for this engine to be built by the Allis-Chalmers Company in America did not happen, so the next two prototypes each had a 16.68kN General Electric 1-40 turbojet, based on the Rolls Royce Derwent and also built by Allison as the J33. This was a larger and more powerful engine than the intended Allis-Chalmers J36, involving redesign which included increased span and length, a taller fin and strengthened landing gear. The exercise cost five months, for it was not until 10 June 1944 that the first of these two XP-80A was flown, by Tony Le Vier. Its first flight performance was not impressive and even with the technical difficulties rectified it was still considered worse than the H1 powered XP-80. The XP-80A's were primarily testbeds for bigger engines and intake duct design, and consequently were larger and 25% heavier than the XP-80, a big factor in their poor performance. The P-80 testing program proved very dangerous. Milo Burcham was killed on 20 October 1944 while flying the third YP-80A, 44-83025 while the "Gray Ghost" was lost on a test flight on 20 March 1945, although pilot Tony LeVier escaped being able to bail out when the engine failed due to a turbine blade failure. These two prototypes were designated XP-80A and were powered by the Allison-developed General Electric J33 engine of 1814-kg (4,000-1b) thrust, with low-set equi-tapered laminar-flow wings and engine air intakes set into the fuselage just forward of the wing roots, this version had a top speed of 898 km/h (558 mph) at sea level. Thirteen development YP-80A aircraft for service trials, with J33-GE-9 or J33-GE-11 engines and an armament of six machine guns in the nose, started delivery to test establishments in October 1944 and it was aircraft of this type that arrived in Italy in May 1945. Two examples reached the Italian war zone just before VE-day, but failed to fly an operational sortie. 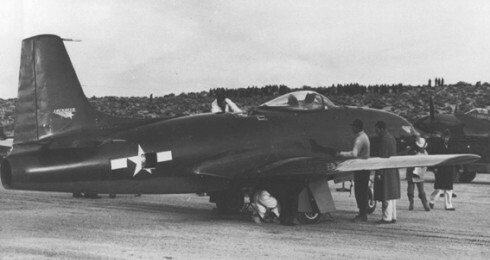 Ordered into quantity production during April 1944, the Shooting Star subsequently suffered cancellations after VJ-Day, but was proceeded with and as the P-80A attained oper-ational service with the 412th Fighter Group during 1946, although poor ser-viceability and a very high accident rate significantly reduced its value. Production P-80A had wingtip tanks and provision for bombs, rockets and fuel tanks to be carried beneath the wings, plus six 12.7mm guns mounted in the fuselage nose. Production deliveries of the P-80A did not start until December 1945, four months too late to see action against the Japanese. The Shooting Star made a number of important flights, these including the first west-to-east trans-atlantic crossing by jet which was accomplished by 16 F-80s of the 56th Fighter Group in July 1948. One Shooting Star has set a world speed record of 1,003.91km/h on 19 June 1947. The P-80 designation changed to F-80 in 1948. 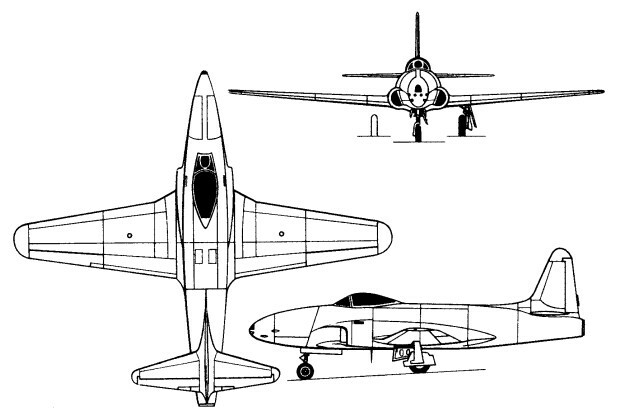 The second model to enter production was the F-80B, which featured numerous refinements such as thinner wing section with thicker skin, stronger bulkheads in the nose section to support greater fire-power, more power, stainless steel armoured engine compartment, provisions for JATO, and provision for rocket launchers. But only 240 of this model were completed before manufacture switched to the definitive F-80C. This possessed even greater power and also better armament and increased underwing weapons capability, no less than 670 being completed by the end of 1950, by which time the USA was in the Korean War. The RF-80C being an unarmed photographic reconnaissance sub-variant. The F-80C saw extensive action in the Korean War, one highlight occurring on 8 November 1950 when an F-80C flown by Lieut Russell J. Brown succeeded in downing a MiG-15 in what was believed to be the first conclusive aerial combat between jet fighters. On the whole, though, the Shooting Star possessed inferior performance and was mainly employed as a fighter-bomber. For Korea, F-80 were adapted to carry two 227kg and four 118kg fragmentation bombs or two 450kg bombs plus eight rockets or four 40 US gallon napalm bombs. 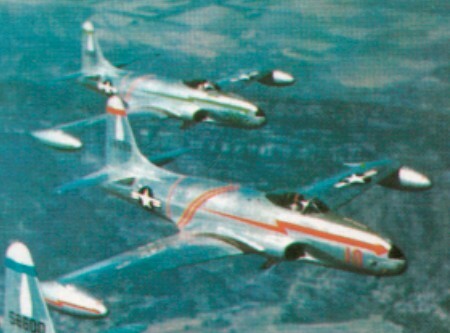 Variants have included reconnaissance RF-80, QF-80A and QF-80F drones, and one F-80C was converted as a prototype two-seat trainer. Engine: one 1814-kg (4000-lb) thrust General Electric J33-A-11 tur-bojet. Wing area 22.11 sq.m (238.0 sq.ft). Armament: six 12.7mm (0.5-in) machine-guns in the nose, 2 x 454kg Bomb / 10x 5" Rockets. Armament: six 12.7-mm (0.5-in) M3 machine-guns, 907 kg (2,000 lb) external ordnance or 16 127-mm (5-in) rockets.